The Namib bed is the smallest in the Conservatoary. It has plants representing various parts of the summer rainfall Namib of both Namibia and Angola. The climate in the Namib although very dry, receives regular fog. The vegetation consists of desert along its coast and arid savanna towards the inland parts. Granite rocks have been used in this section. Other smaller rocks include dolomite from Khowarib Poort and dolerite from the Brandberg region. A Welwitschia plant has also been established here from seed planted directly into this bed. Welwitschias are one of the world’s most bizarre cone-bearing plants. Males and females are separate plants. 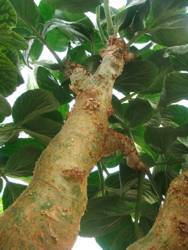 The plant consists of only a short woody and fibrous stem, two opposite leaves as well as a tap root. The stem growth point withers in the seedling stage (stem arrested in juvenile phase) and apart from leaf growth, the only growth that takes place is in the leaf primordium, eventually resulting in the obconic head. The leaf growth is also unique- it is continuous, and on average about 8-15 cm per annum. 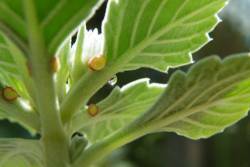 The stem growth is very slow, about 1-3 mm per annum. The latter can grow, in exceptional cases, up to 1,5 m in tall in habitat and become about 2 0000 years old. The plant is a paradox, as small leaves are usually associated with desert plants. Why leaves of such dimension? If one looks at the plants habitat, it coincides with the fog belt. The regular fog of the cold Atlantic Ocean condenses on its leaves and provides extra moisture. The plant produced cones during the summer months. Another characteristic species planted in this section is the thickset Cyphostemma dwarf tree. The display includes two large kobas (C. currorii), Baines’ kobas (C. bainesii), blue kobas (C. juttae) as well as Kaoko kobas (C. uter). They belong to the grape family (Vitaceae). They are deciduous, with large tri-foliate leaves and produced in summer and shed in winter. A number of Euphorbia species have also been planted such as the Avas noors (Euphorbia avasmontana), knoppiebasnoors (Euphorbia leistneri), and the tall Kaoko tree-euphorbia (E. eduardoi) in the centre of the bed. Other plantings include the rock corkwood (Commiphora saxicola) the Windhoek aloe (Aloe littoralis) and two mother-in-law’s tongue species (Sansevieria aethiopica, S. cylindrica). 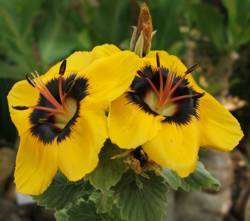 The Namib Turnera (Turnera oculata) is an erect shrub to 2 m tall, bearing striking yellow flowers with a dark centre. It grows in the northern Namib and belongs to the Turnera family (Turneraceae). The leaves are leathery and each has two glands along the lower end of the blade and top end of the petiole, exuding nectar. This is called extra floral nectarines. Ants feed on the nectar, but also protect the flowers from any insect predation. Note the yellowish coloured oval glands and the nectar droplet at the top end of the leaf petiole. The Kaoko spurflower (Plectranthus unguentarius) is a shrub with pleasantly fragrant leaves. It is an erect multi-stemmed shrub bearing semi-fleshy or leathery leaves and whitish flowers during autumn. The Osonanga Lilly (Pseudogaltonia clavata) is widespread in northern Namibia and has elongated strap-shaped leaves with erect racemes of flowers up to a metre tall. The plant flowers during December. The tubular flowers are white to cream. The python vine or luislangkambro (Fockea multiflora) has a huge gray coloured succulent stem with climbing branches clinging like a python to the trees. The Namib stinging nettle (Obetia carruthersiana) has large spiny leaves bearing irritant sap. The large leaved star-chestnut (Sterculia quinqueloba) is a tree with a characteristic pale bark flaking characteristically. The Namib coral tree (Erythrina decora) is a small tree with a corky bark and coral red flowers. The phantom tree (Moringa ovalifolia) is a deciduous thickset tree which can grow up to 8 m tall. It grows in the northern Namibia and has a pale smooth bark eaten by game. It is especially common at the Sprokieswoud in the Etosha National Park. After flowering this spectacular tree bear elongated pods. Smaller plants introduced here includes Kalanchoe laciniata with attractive divided leaves. It has a fleshy root and becomes deciduous during the winter months. During late summer the yellowish-orange flowers appear. Petalidium rubescens and P. bracteatum are scandent shrubs bearing striking red flowers have been planted adjacent to the main pillars. They flower from winter to summer. Other species includes the Herero sesame bush (Sesamothamnus guerichii) and Schinz’s Stapelia (Stapelia schinzii). Visit www.plantzafrica.com to find out more about the plants and how to grow them.